VIRGINIA WERE THE FIRST PORT TO HOST THE COSCO DEVELOPMENT: The containership was biggest ever to call the US east coast. Port of Virginia had fourth consecutive fiscal year of volume growth. 61 percent of volume at Port of Virginia handled by truck, 36 percent rail, three percent barge. Rail containers moved by the Port of Virginia in fiscal year 2017 were up 11.3 percent from 2016. The Port of Virginia handled 231,675 twenty-foot equivalent units (TEUs) in June, a new record for the month and a seven-percent increase when compared with the same month last year. With this achievement, the port completed fiscal year 2017 having handled a record-setting 2.7 million TEUs, up 7.3 percent from the year before. “We finished fiscal year 2017 with a solid volume increase and thus marked our fourth consecutive fiscal year of volume growth,” said John F. Reinhart, CEO and executive director of the Virginia Port Authority. “We grew in the right areas, we moved a record-amount of volume across all modes of transportation, train, barge and truck—and did so safely—and we continue to improve our service levels. The $670 million we are investing to expand the capabilities and capacity at The Port of Virginia are aimed at sustaining this trend into the next several decades. 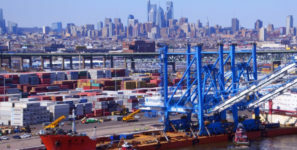 This growth comes as the port is in the process of expanding capacity at its two primary container terminals: Norfolk International Terminals (NIT) and Virginia International Gateway (VIG). The port is investing $320 million to double container capacity at VIG, where work commenced in February 2017 to expand the port’s annual container throughput capacity by 40 percent by 2020. The port is also investing $350 million to renovate the south container yard at NIT, and expand cargo capacity by 46 percent, a project announced by Gov. Terry McAuliffe in July 2016. In June, the port opened its new 26-lane, North Gate at NIT, a $42 million investment that will increase the throughput of trucks. In May 2017, the port was the first to host the 13,000-TEU COSCO Development, the biggest vessel ever to call a port on the US east coast.